Used by the NYPD, the FDNY, New York City Sheriff as well as residents and businesses throughout the 5 boroughs. Check out our 5-star ratings in Yelp, Google and Angie’s List. We’ve worked hard to maintain New York City’s top locksmith. it comes by way of an unwavering commitment to honesty and service. Your safety and security is our highest priority. That means we’ll get to you fast when your stranded and vulnerable. We understand your needs better than anyone so give M&D Locks and Keys a call whenever you’re locked out and need an immediate response. Call us at (718) 484-4050. Not only do we get to you fast, but we get you on your way fast, too. M&D vans have the most advanced lockout equipment and tools in the business. We can manufacture a new key on the spot, extract broken keys and get you back on your way with having to go back to the shop for parts. 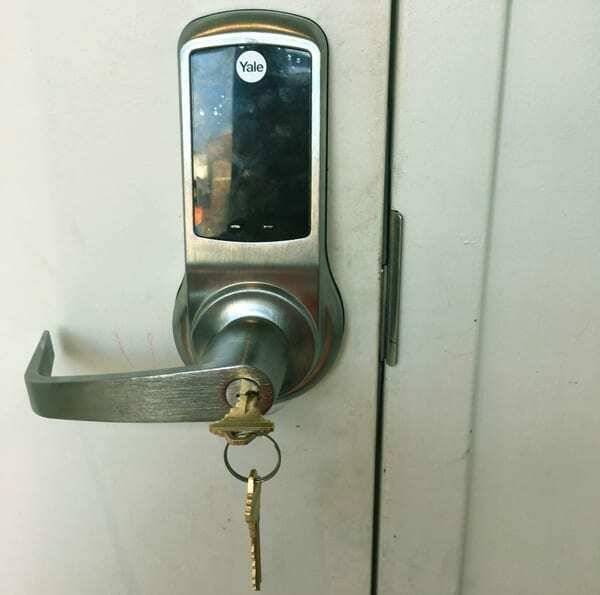 Even if you’ve lost your keys, we can access your make and model number online and get you a replacement transponder key, remote access device, keyless entry unit or panic button -all from our van. That’s a capability that most other locksmiths don’t have. 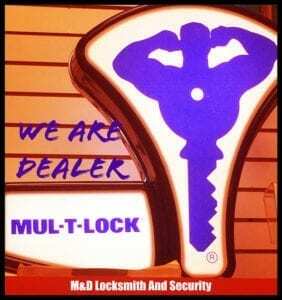 Perhaps that’s why many NYC locksmiths refer their customers to us. When you hire an M&D professional locksmith, you’re getting a real licensed lock and key pro that not only knows how to get you in and on your way, but will do it without destroying your property. Don’t hire just any locksmith you find online. Many of them aren’t locksmiths, but are call centers that send your request out to the highest bidder, regardless if they’re licensed or not. You can usually recognize them because they use bait and switch tactics, advertising a cheap $19 or $15 lockout service, but when they arrive, you find out that price was only for the service call. Getting you back in will cost a lot more. That’s when you call M&D Locks and Keys. M&D Locks and Keys is a true local locksmith with two shops in New York City and fully functional mobile units patrolling all five boroughs. 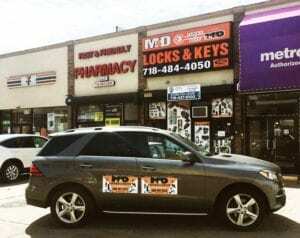 When you call M&D, you get a locksmith who is not only a NYC community partner, but one that promotes honest and fair business practices as established by the FTC and Better Business Bureau. We’re licensed, certified and insured. We know trust is important so all our locksmith apprentices work alongside our seasoned professionals and must pass our rigorous standards before they can call themselves an M&D Locksmith. They also get trained on navigation so they know the best routes to get to you the quickest, even during that NYC rush hour. Once they pass all these requirements, then they and become certified and are eligible for membership in the Associated Locksmiths of America. Locked out? Broke your key in the lock? Perhaps you’ve lost your keys and don’t have a spare. Regardless of the emergency, our mobile locksmith units patrol all 5 New York City boroughs and are equipped with state-of-the-art lockout technology. We can make a new key for you on the spot, even if you’ve lost the original. FOB and transponder keys? No problem. High tech security systems? No problem. Vintage, broken and rusted locks? No problem. Regardless if you’re in Manhattan, Brooklyn, Staten Island, Queens or the Bronx, chances are there’s a mobile unit right around the corner so give us a call at (718) 484-4050 for immediate service. Do you have a business that needs constant surveillance? Do you need to keep an eye on employees when you’re not there? Or perhaps your need is the most important of all — protecting your loved ones at home from intruders or caregivers. We install and service a full range of security cameras and electronic surveillance equipment from top line security manufacturers such as Bosch, Sony and Samsung. Whether you need a dome camera, network/IP camera or a heavy duty outdoor camera, call us for an evaluation and estimate today at (718) 484-4050. Is trust a priority? Well, it is for us. That’s why M&D Locks and Keys has the best customer reviews in the business. 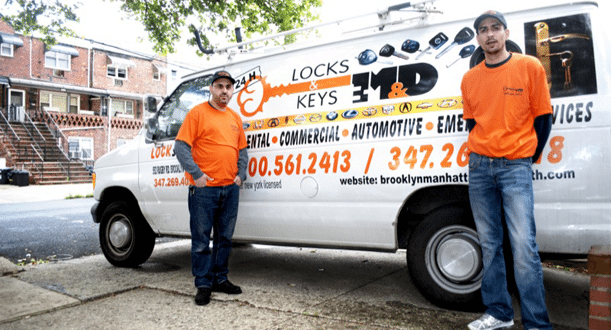 Not only do we have years of lockout experience in New York, but all our apprentices go through rigorous training and work alongside seasoned professionals before they qualify to become a locksmith at M&D Locks and Keys. All technicians are licensed with the Associated Locksmiths of America (ALOA). They’ll never show up without a uniform or company vehicle and will proudly display their license, certification and insurance when asked. Discover why New York residents consistently give us 5-star ratings and reviews. Call us at (718) 484-4050.